Boring housework day to day, sadly it has to be done, my house elves have all gone on strike so it's just down to me!!! Very windy out there today so what to do for Flower Friday that I haven't done before. 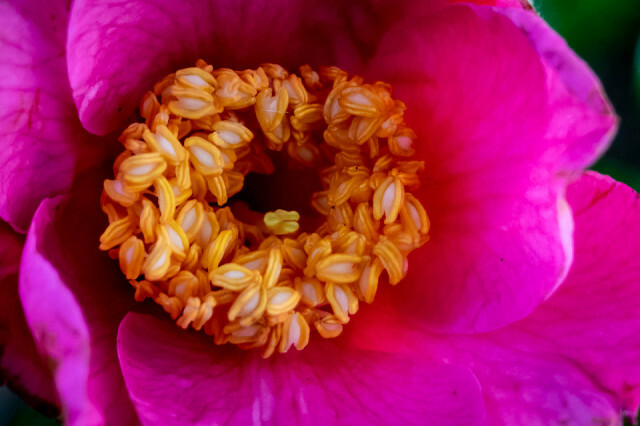 I've tried doing a close up of the centre of one of lovely camellias. Most are still in pink bud form but a couple have fully bloomed, this is one of them. The close is better as the edges are now decaying. Not too bad a shot for my ordinary kit lens. I'd love to be able to afford a macro lens but that's not going to happen. I may be able to save up for some extension tubes though, but then I've got to work out which ones I need, how many and how to use them!!! Have a great day everyone, and for those that work, enjoy your weekend.